As you continue your studies in the new semester, it’s important to remember to take care of your personal safety in addition to your education and social activities. Every year, thousands of crimes are reported at college campuses all across the country and while many students are simply in the wrong place at the wrong time, it doesn’t hurt to be prepared if something does happen. This app allows you to choose six friends or family members as emergency contacts. With the tap of a button, you can send out a pre-written text or even your location to one or more of them. The text can, for example, instruct them to come pick you up, give you a distracting phone call so you can leave a peer-pressure scenario or alert them that you may be in a bad situation. It can also contact 911 with a help request and your GPS location information. Circle of 6 helps campus safety by allowing students to help each other out as they travel around alone. 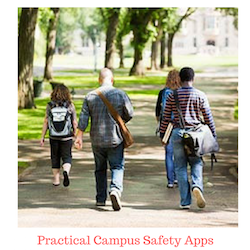 LiveSafe is essentially a two-way communication port between its users and campus security. Using the app, you can quickly send details of the crime, your GPS location and even pictures of the crime or perpetrators. This info becomes immediately available to officers at the campus security office and in their service vehicles. This platform was developed by a survivor of the terrible 2007 shooting at Virginia Tech and is currently used by over 4,200 students and faculty. Here is a GPS-enabled app that allows your friends to help keep you safe. When activated, Companion sends a link to friends that you have chosen ahead of time that allows them to track your progress as you walk. If your phone senses abnormal jostling, like would occur during an attack, the app will ask if you are alright. If you do not respond in 15 seconds, it sounds an alarm and automatically sends an alert to the police along with your GPS coordinates. OnWatch allows you to set a timer that can only be stopped with a passcode. If time expires before the app is disabled, the contacts that you chose ahead of time will be notified by an automated phone call, text, email or Facebook notification of a potential problem along with your location. OnWatch is the 2012 winner of the Apps Against Abuse Technology Challenge. The SkyApp is perhaps the most functional of the safety apps. If you live in a fraternity or sorority house or even a dorm and need the extra confidence that an intruder or burglar won’t break in or at least be caught, you may want to consider SkyApp’s compatible gadgets. The SkyApp connects to multiple devices, including a security system (for your house) or surveillance cameras. The app allows you to monitor your living quarters with live security video and turn on or off your security system while you’re away from home. Videos will allow you to catch your intruder whether or not they took anything. This app lets you store key phone numbers, like police, campus security, crisis hotlines and friends, so you do not have to look through your contacts to place a quick call if there is an emergency. One tap is all it takes to connect to these important numbers. CampusSafe also features a panic button that alerts emergency personnel with your location information and stores important safety resources, such as crime prevention tips and lost item reporting. This simple app shows location coordinates for a group of friends that you select. If the group gets separated, it is easy to keep track of everyone. This way, all of the participants of a fun night out can share the responsibility of the group's safety. DrunkMode also conveniently stores contact information for everyone in the selected group so you can contact each other quickly if someone suspects a problem. By taking initiative and preparing for the worst, you can prevent any crime or violent acts towards you while you’re alone on campus. At the very least, you or police officials may be able to catch the offender and prevent them from doing the same thing to someone else. By Maricel Tabalba is a freelance writer who is interested in writing about smart gadgets, emerging tech trends and environmentally friendly advice. She earned her Bachelor of Arts in English with a minor in Communication from the University of Illinois at Chicago. Disclaimer: NextStepU is not responsible for the accuracy, content and functionality of the listed applications.